The road infrastructure in remains the backbone of social and economic activities, as economic development is closely related to the condition of road development. Generally, roads are considered a country’s biggest public capital asset, as it can contribute immensely to its Gross Domestic Product (GDP). Nigeria has a national road network of about 200,000km. Of this total, federal roads make up 18 per cent (about 35,000km), State roads 15 per cent (about 17,000km), and local government roads 67 per cent (about 150,000km), with over 90 percent of the local government roads unpaved and over 50 percent unmotorable. Experts said for Nigeria to achieve a national economic growth and development, an efficient road transport network has a critical role to play adding that good road network across the country would greatly make positive impact in our national life. It would facilitate opening up of the rural areas, enhance investment and socio-economic activities, reduce accident rate as well as promote international perception index of Nigeria; thereby attracting Direct Foreign Investment (DFI) which is critical to economic growth. For this reason, AG-Dangote Construction Company and other experts in the built environment have continued to clamour for a change of strategy and approach in road construction and management. Speaking at the flag off event, president/chief executive, Dangote Industries, Aliko Dangote, extolled the federal government for the executive order #7 which allows private sector intervention in the provision of critical infrastructure. 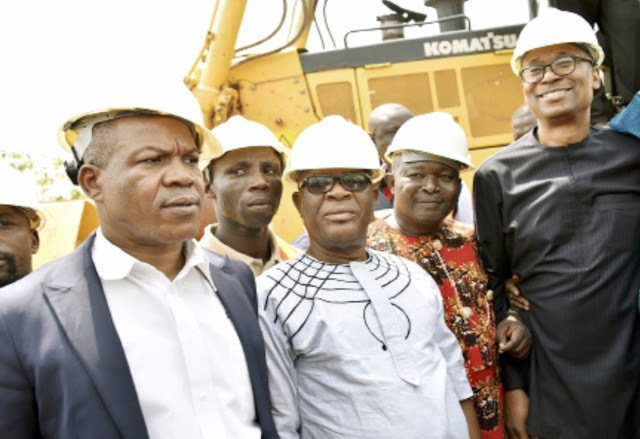 Dangote who was represented by the South South Regional Director of Dangote Cement, Mr. Okoro George, said a new dawn is coming to Ofeme community as the deplorable state of their roads would soon be a thing of the past. He added that AG-Dangote has established itself as a construction company of repute having delivered the 26-kilometre Ibese-Itori concrete road in Ogun State, the 2 kilometre Apapa-Wharf dual carriage concrete road, the ongoing 43-kilometre Obajana-Kabba concrete road and the 35-kilometre Apapa-Oworonshoki Expressway. Minister of Power, Works and Housing, Mr. Babatunde Fashola, speaking at the flag off described the Ofeme Community road network reconstruction as a gigantic project that open the community and surrounding towns to development. The Minister, who was represented by Federal Controller of Works, Abia State, Engr. Nwankwo Chukwudike said the project on completion would open up access roads to manufacturing clusters in the area, reduce high cost of transportation and raise the standard of life for the people. He said movement of agriculture produce from the farming hubs will become cheaper and easier, bringing in more income. Minister of Industry, Trade and Investment, Dr. Okey Enelamah in his remarks at the flag off said the present administration, desirous of providing critical infrastructure, enacted Executive Order #7 which involves partnering the private sector. He said the road reconstruction project is one of the many development oriented projects coming to the community. According to him, we are pushing for Nigeria to do a concrete road. It is cheaper to do a concrete road that will last over 40 years than to do a bitumen road. It will also help in eliminating corruption. The project is for the benefits of the community. It is obvious that the option for concrete roads will be the solution to solve the road infrastructural decay in the country. This is because concrete road is less expensive than asphalt road by almost 23 per cent and also we can build concrete road in less time. cc: OLUSHOLA BELLO writes on how Dangote Industries Limited through its subsidiary, AG-Dangote, is focusing on road development in order to address infrastructural gaps in Nigeria.